A view of the breached dam at the Silver Mines Recreation Area. Here's another great site that I discovered on a field trip in college, the Silver Mines Recreation Area, which is part of the Mark Twain National Forest, is located near Fredricktown and Ironton, Missouri. This area is named, ever so aptly, for the abandoned silver mines that are found here that were mined from 1877 through 1946 by the Einstein Silver Mining Company. Given that the operation spewed tons of rocks (leavings or tailings) from deep within the Earth as the miners searched for their target minerals of silver, tungsten and lead, this is a relative Shangri-la for rock hounds, who come from far and wide, rock hammers in hand to see what treasures they may unearth from the rubble. 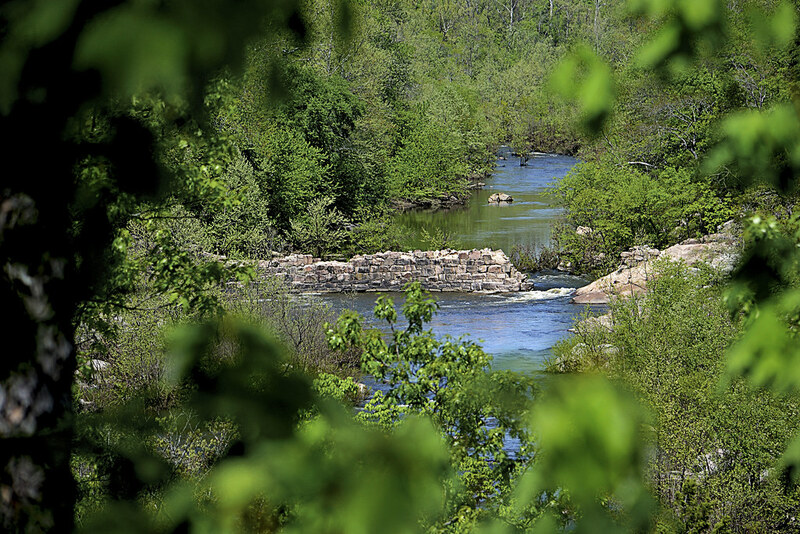 But those who are not out to hunt for minerals and stones may be after a different type of thrill, the thrill they find on the St. Francis River, the thrill of the only true "White Water" to be found in the state. I knew that the sound of rushing water and the possibility of finding some rare minerals would certainly interest my wife and daughter... and I couldn't have been more right. A dragonfly paused long enough to give me this shot. There are actually two hiking trails here, I'll send you to the one that is on the South side of the St. Francis River, that runs near the "Air Conditioner" mine and the tailings from the mine operations the North side is every bit as beautiful and slippery as the South, I just love rock hounding). After parking the car (be aware there is a day use fee of $2.00 per vehicle here, place your payment in the envelope and slip it into the locked container) you will make your way across the concrete walkway then head to the right to begin your one mile hike up to the dam. This hike is absolutely stunning, with gorgeous granite and felsite outcroppings and stunning views of the St. Francis River marking the trails progression. Be careful though, the same granite and felsite rocks that are so interesting to look at and examine may be the same formation may cause your rear become painfully acquainted with the hard ground and said rock, as these rocks can become quite slippery after rain or covered in early morning dew. A member of the "indigenous" population takes a sun. As you continue up, past the scenic overlook (which was in some disrepair on our visits there), be sure to stop by the "Air Conditioner" Mine and have a seat, especially on a hot Midwestern summer day! The air that comes from the mouth of this abandoned mine is more than cool enough to invigorate you for the rest of your short hike to the dam. You may not always be able to take a seat here though, as the available space at the mouth of the mine may be flooded with a foot or more of water, depending on the last time it rained in the area. Soon after taking a cooling break you will reach an area that is just pure rock, these are actually all tailings, from the mining of the area. This is a GREAT place to stop and begin exploring the different types of rocks and searching for some rare silver, quartz, or even small fragments of various gemstones. While you are exploring the abandoned tailings for interesting rocks and formations, BE CAREFUL! 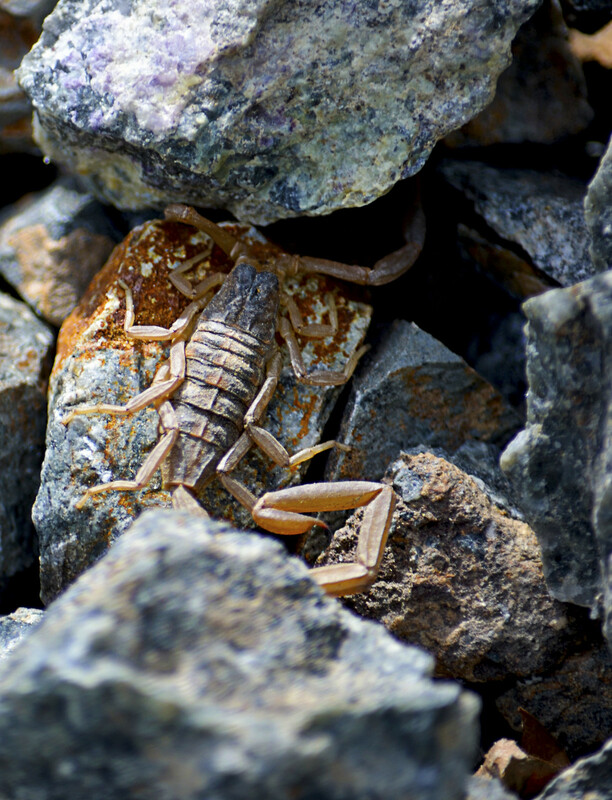 The native inhabitants of the area, which include snakes and small scorpions, may be hiding underneath rocks as you overturn them, use a stick... Please. 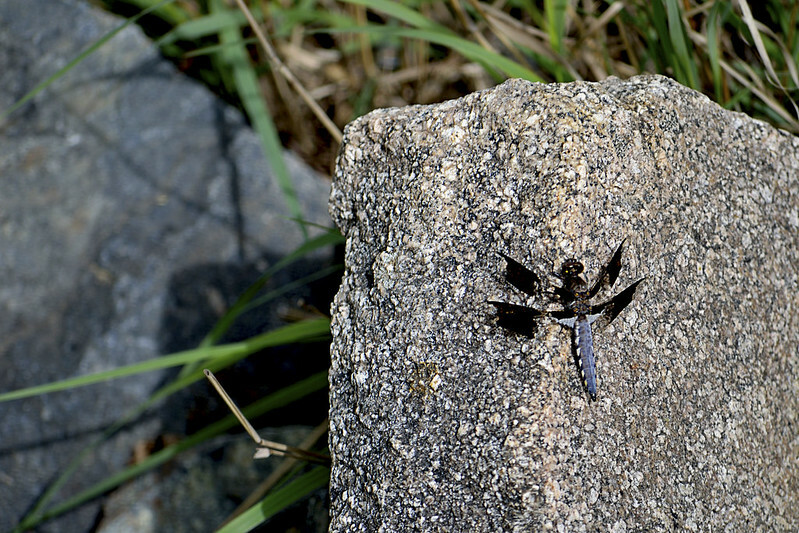 This is the only place I have ever been, in Missouri, that I have actually found a scorpion (see the photo). I found this scorpion by picking up a rock, mere centimeters in front of its "face" and was beyond lucky not to have been stung. On a separate note, I believe that purple mineral found on the rocks there is flourite, and you'll find a great deal of that in the rocks here. Also be careful on the loose rock, period. It may shift at anytime and send you sliding down the hill. An amateur geologist also presented us with this small bit of knowledge (I can't vouch for the accuracy of it though), if you are looking for a bit of silver, most of it is contained in small veins you can find in the quartz rocks of the area. 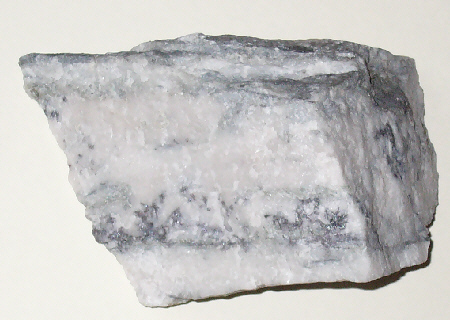 The silver here may appear dark or almost black to slightly silver metallic in color. 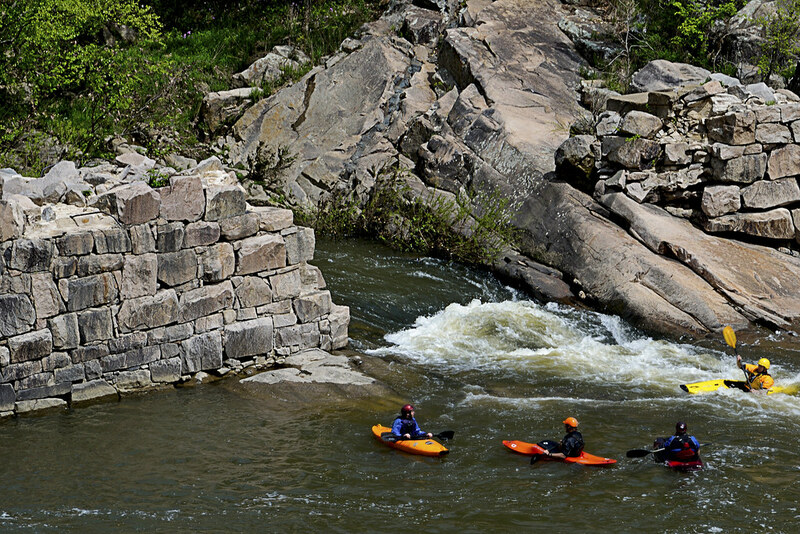 While rock hounding you may also keep an eye to the St. Francis River, particularly during the Spring, as you will undoubtedly be able to spot some crazy kayakers as they shoot out of the breach in the dam that used to span the river. These folks are amazing to watch and I've heard epic party details from when the American Whitewater Championships are in swing there during weekends in March. I never tire of watching the kayaks slice the water and navigate down the river through the dam. Overall this is one of my favorite spots to visit and I certainly hope I didn't scare anyone with the shifting rocks, slippery outcrops, snakes and scorpions (dangers exist in all of the great outdoors), there is just so much to see and do. The whole family enjoys looking through the rocks, searching for that next shiny little "gem" and the wildlife certainly can keep you on your toes. When you couple that with magnificent views, a mine that can provide you a bit of A/C, a cooling river that you can take a wade in (but be careful of the current and dropoffs) and some wonderful plants and rock outcrops to explore, it's hard not to have a great family time! 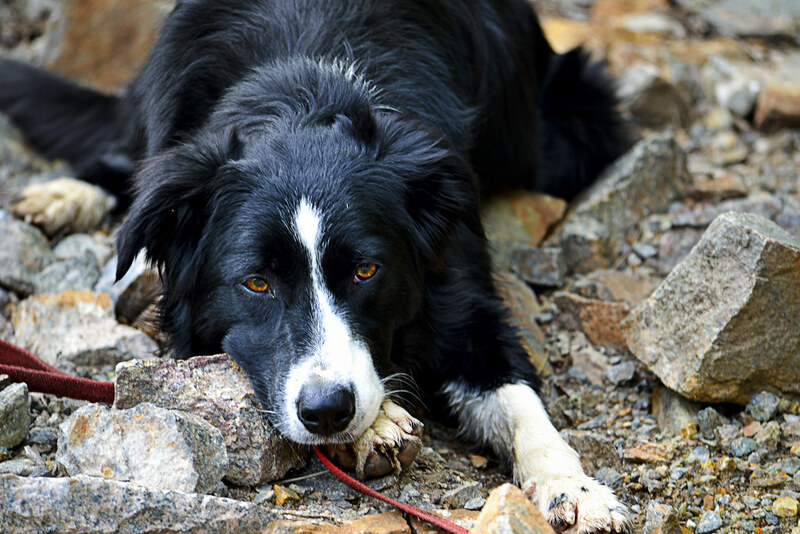 All the action can exhaust even Hyatt, our border collie... And that's TOUGH! 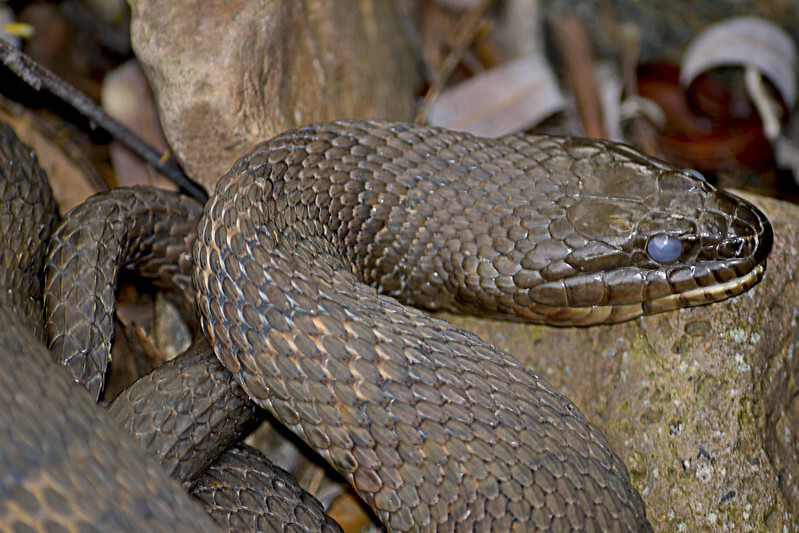 Happy trails and watch where you step! Federal Regulations on "Rock Hounding"